We have a selection of deeply gorgeous boutiques to super luxe hideaways all of which boast amazing locations and fuse luxury and service. 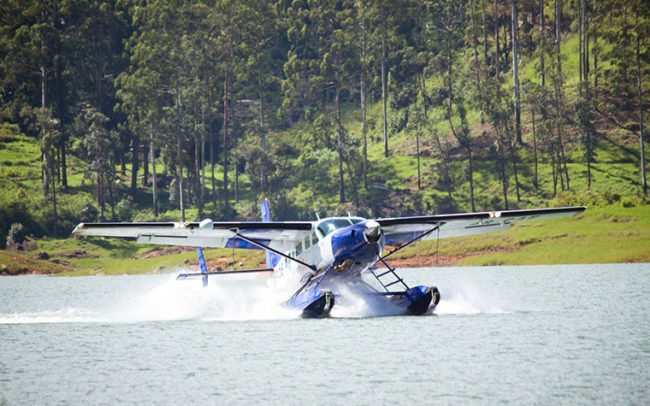 At Sri Lanka Bespoke we very carefully handpick hotels and only recommend those that we love. Sri Lanka has shied away from the large chain properties and what has emerged is a beautiful selection of unique and luxurious boutique hotels that boast a stunning location, a striking design or a sense of history. We have visited every hotel that we recommend and have chosen those that combine sophistication, style and authenticity. We have a selection of deeply gorgeous boutiques to super luxe hideaways all of which boast amazing locations and fuse luxury and memorable service to ensure that your experience in this tropical paradise is close to perfection as possible. We are an independent boutique with intentionally no commitment to any one hotel. 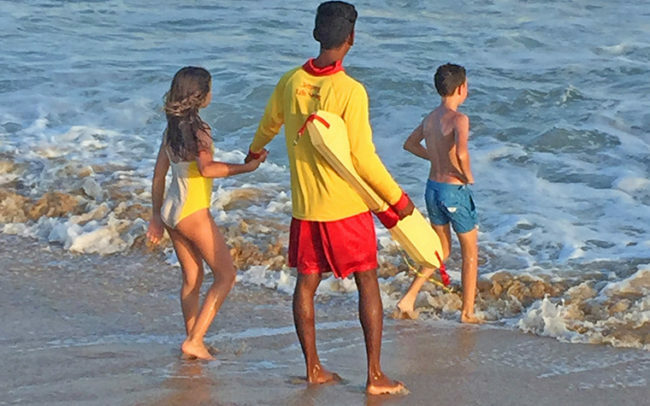 This allows us to truly tailor-make your Sri Lankan stay according to you and your needs and tastes. Here is just a small sample of some of our favourite hotels. The unique and luxurious Chena Huts, inspired by the small clearings in the jungle called chena for farmers to guard their crops, are far from their modest ancestors. Super-luxe safari residences nestle among dunes and luscious jungle at the ocean’s edge. Overlooking a beach, expect sea turtles laying eggs by moonlight and wandering elephants playing in the surf. You will have your own private ranger throughout your stay. The rangers here are incredibly knowledgeable and will accompany you on your game rides into the adjacent natural reserve – Sri Lanka’s oldest and second-largest Yala’s national park. Expect prime viewing of elephants, leopards, water buffalo exotic birds to name a few. Between safaris relax on your private pavilion boasting views of the surrounding wilderness and seascape. 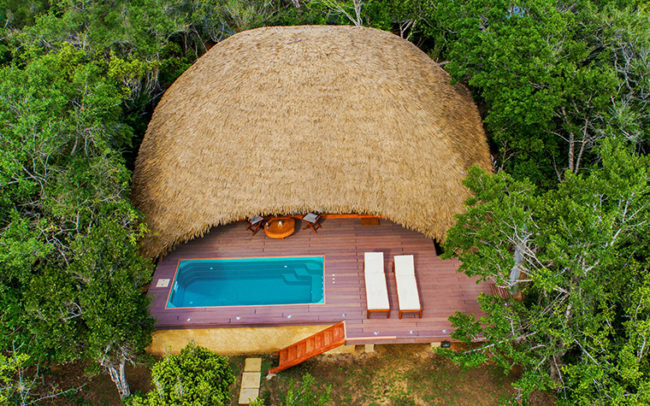 Each Chena Hut is hugely spacious and comes complete with private decks and plunge pools. 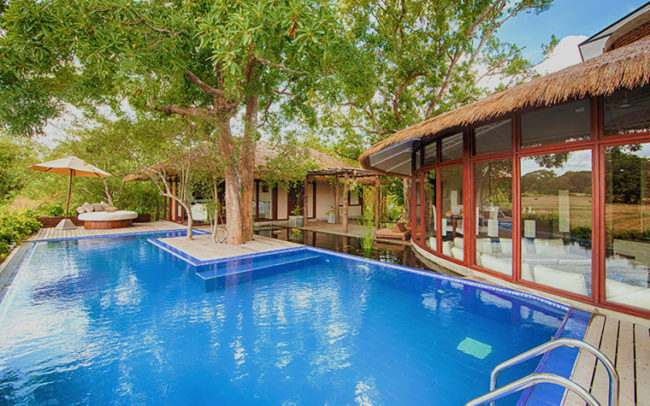 Natural stylish interiors with sumptuous furnishings will ensure a luxurious stay at this ocean-facing jungle haven. SLB Loves: The staff and rangers are so incredibly friendly and welcoming. You’ll have to tear yourself away from the luxuriously appointed huts – they are simply awe inspiring. Luxury meets nature and culture at Water Garden Sigirya. Surrounded by lakes and water streams with a breathtakingly beautiful view of Sigirya Rock Fortress, this beautifully laid out, boutique hotel is inspired by the ancient water gardens of Sigirya. An oasis of natural beauty in the heart of the Cultural Triangle, first impressions of the minimalist reception is nothing short of stunning. Designed by Channa Dawatta, a protégé of the renowned architect Geoffrey Bawa, the luxurious and spacious chalets with private pools, living rooms, French windows onto private terraces all proffer views over the surrounding water gardens. A perfect base in the Cultural Triangle, just 8km away Sigirya and ancient cities of Dambulla, Polonnaruwa and Anuradhapura are all within reach. SLB Loves: The chalet interiors are extremely stylish. Designed by Rose Perry, expect stylish sofas, dining tables and writing desks. Make a point to relax at the handsome open-air bar on the ground floor which is huge. Sip on an afternoon cocktail whilst the children take a dip in the children’s pool. Perched on a cliff top in twelve acres of immaculately landscaped gardens, Cape Weligama has uninterrupted views of the Indian Ocean with beaches aside this luxurious resort. With a striking crescent shaped infinity pool, a main pool, a private infinity pool and a further twelve shared infinity pools, this resort doesn’t fall short by any expectation. This spacious hotel has 39 villas with stylish interiors that are the largest Luxury Villas in Sri Lanka. Daily complimentary high tea is served every afternoon and exceptional cuisine in the three restaurants daily. Enjoy sundowner cocktails at one of the three Cliff Edge look out points listening to the crashing waves or in the stylish club bar. Enjoy a variety of experiences or excursions or simply curl up in one of the lovely alcoves of the resident bar and restaurants. SLB Loves: No request is too small for the attentive, smiling staff who have also been trained in the art of listening vs. hearing. Look out for the beautiful mid-century modern chairs in the downstairs bar. With an outstanding reputation for comfort, cuisine, genuine hospitality and tropical paradise charm, this beautiful luxury beach resort will not disappoint. Situated on the tranquil East coast renowned for its spectacular beaches, Uga Bay offers a fantastic combination of beach bliss and adventure. As well as the glorious infinity pool, cabanas and shaded loungers there is an array of watersports and the Pasikuda’s reefs and wrecks are a snorkelling and diving paradise. All villas come with private terraces, rain showers in stylish bathrooms and views of the azure waters of the Indian Ocean. The chefs go out of their way to offer a variety of fresh seafood cuisine to Sri Lankan curries. 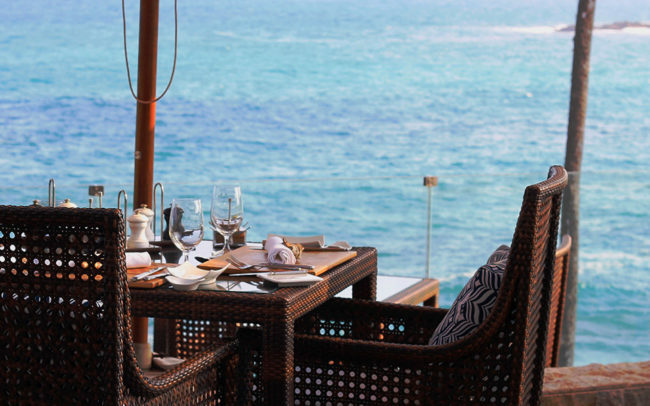 Enjoy beach barbecues or private dining and a sunset cocktail at the beach bar is a must. SLB Loves: Experience Uga Signature Sand Dining. A utterly romantic and unique setting where your table and chairs are carved within the golden sands. The underground spa offers spell binding views of the Indian Ocean whilst you’re enjoying the Balinese and western therapies. A colonial grande dame, AmanGalle is perfectly placed in the inside walls of the historic Galle Fort – a Unesco World Heritage Site. Built in 1683 as the Dutch Military Headquarters, its former heyday was as the New Oriental Hotel in the 19th Century. Steeped in history this deluxe hotel retains its heritage in every architectural and decorative detail. Original antiques and polished teak floors pay homage to this historical edifice. Linger in rooms with shuttered French windows, gorgeous four poster beds and traditional Sri Lankan Pettagama chests. The Baths spa is overwhelmingly beautiful with candlelit chambers and hydrotherapy pools. Complete with a barber shop and salon, relax on the sun loungers by the gorgeous pool under the shades of the ambalamas (pavilions). Taking tea on the verandah is a signature AmanGalle experience and soak up life as it passes by on Church street. SLB Loves: Book an appointment with the in-house ayurvedic doctor to sooth any niggles and then tuck yourself away in the ambient library for a truly serene retreat. Indulge in the amazing packed lunches provided for your day trips when exploring this historic town. 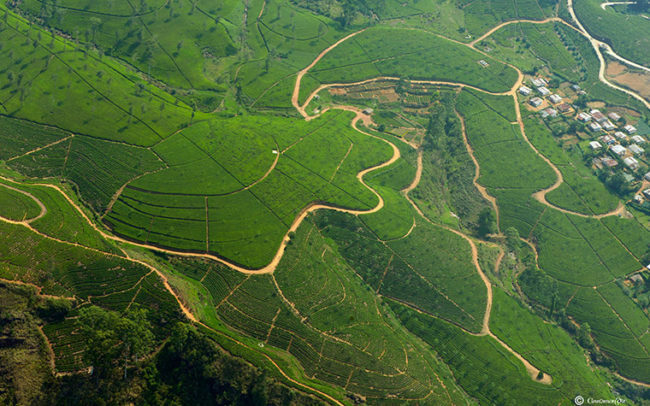 An exclusive escape that boasts an extraordinary perspective of Kandy’s majestic hills. Kings Pavilion is a luxury boutique hotel that is an ultimate hideaway in this ancient hillside kingdom. Soak up the lush greenery and 360 degree stunning mountain vistas from its infinity pool or retreat to the unique living spaces that fuse traditional Kandyan charm with modernity. Rooms and suites have a distinctive décor that expertly blend contemporary luxury with old world charm. The staff are supremely welcoming and will ensure that guests are pampered like kings from arrival to departure. Enjoy the butler service that will care of your every need. Spacious balconies, luxury rooms and contemporary comforts make this hideway an exceptional Kandyan experience. SLB Loves: Enjoy what has been called the best breakfast in Kandy and experience an incredible treatment in the Kings Pavilion spa. Before leaving make a point to check the guest book – the comments are simply outstanding throughout.